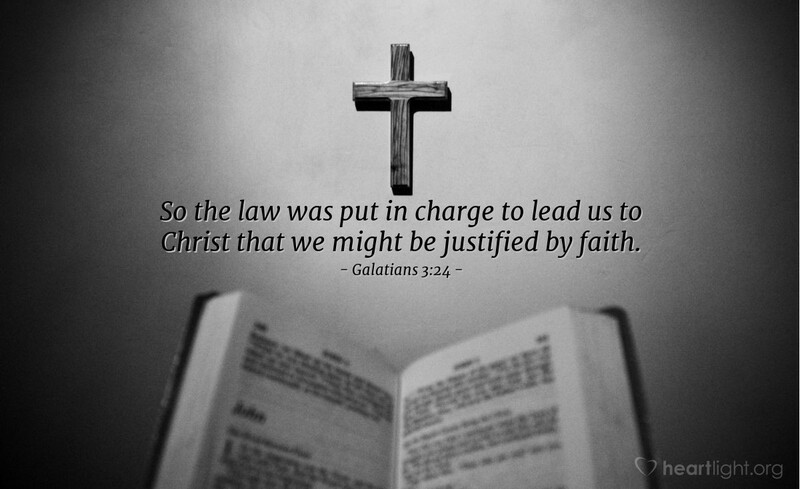 Galatians reminds us again and again that law cannot make us righteous or save us, not even the Old Testament Law. However, the Law does one very important thing. It leads us to Christ. We recognize right and wrong because of the Law. We recognize our failures, imperfections, sins, transgressions, and weaknesses because of the Law. Most of all, we recognize our need for a Savior because of the Law. Praise God for the Law. Praise God a hundred times more for Jesus! Thank you, dear Heavenly Father, that the goal of your Law was to bring me to Jesus. It helps me appreciate his perfection. It helps me know my sinfulness. Most of all, it helps me realize that his sacrifice gives me what the Law cannot — your righteousness. Father, I do truly believe with all my heart that Jesus came to die for me and give me life. In Jesus' name, and because of Jesus' righteousness, I thank you! Amen.